ALEXANDRIA, VA (September 25, 2008) - Total visitor spending in Alexandria topped $584 million during calendar year 2007, generating $19.5 million in City taxes and supporting 5,600 jobs with payroll over $101 million. Despite a national slowdown in tourism, visitor spending in Alexandria rose 3.84 percent compared to 2006. The Alexandria Convention & Visitors Association (ACVA) reported these tourism statistics today as part of its presentation to members at the 2008 Annual Membership Meeting, citing figures generated by the Virginia Tourism Corporation. "Tourism continues to be a significant contributor to Alexandria&apos;s economic base," said Stephanie Brown, President and CEO of the ACVA. "Although our tourism industry continues to report strong results, we are sensitive to the effect of increased costs of gasoline and air travel, and volatility in the economy in general, on travel plans." "We are broadening our fiscal year 2009 marketing strategy to incorporate a new, regional marketing program designed to increase day-trip visitation from the greater Washington, D.C. area, Northern Virginia and Maryland, and including a focus on shopping and dining in Alexandria," Brown said in a speech to ACVA members Thursday. The regional plan is supported by $300,000 in dedicated funding authorized by the Alexandria City Council. The campaign will focus on shopping and dining in Alexandria and will feature both print and radio advertising. A partnership with the Washington Metropolitan Area Transit Authority will result in a joint marketing initiative including Metro bus backs and back-lighted panels in key Metrorail stations. At the association&apos;s annual meeting, Brown unveiled the ACVA&apos;s marketing campaign for the 2009 fiscal year, which is destination focused, a departure from a former seasonal approach. Target segments are tourist in-market, destination (leisure travelers within a five-hour radius) and regional. A new creative direction incorporating print, electronic and online marketing presents Alexandria&apos;s historic ambiance and contemporary flair with engaging photography. The entire plan incorporates Alexandria&apos;s tourism website VisitAlexandriaVA.com as the core of the strategy. The ACVA added Travelocity&apos;s booking engine to its home page in April as an interactive tool for planning visits to Alexandria. Supported by online marketing campaigns, traffic to the website increased 173 percent through May, 2008 and the booking engine already ranks in the top 20 of the 141 destination websites supported by Travelocity. "In June, we selected SimpleView, one of the travel and tourism industry&apos;s most prominent website design firms, to redesign VisitAlexandriaVA.com into an informative, interactive experience introducing visitors to the many attractions, restaurants and shops awaiting them in Alexandria," Brown said. "The newly designed site will provide special sections to promote Alexandria&apos;s neighborhoods and unique history." The ACVA plans to launch the website redesign in November. With the many new amenities precipitated by the opening of National Harbor last April, Alexandria presents an enhanced experience to its visitors arriving from all directions outside the City. Through the efforts of a joint City-business community effort involving the local residential community, Alexandria&apos;s waterfront has become a welcoming, informative gateway to the historic district for visitors arriving by the new Alexandria-National Harbor Water Taxi. The King Street Trolley became an overnight success, carrying over 300,000 passengers within its first five months of operation, Visitor Center hours have been extended from 5 to 8 p.m.
"We have a culturally rich and historic destination to offer our visitors," Brown said, "And a creative, interactive and targeted marketing strategy to get them here. 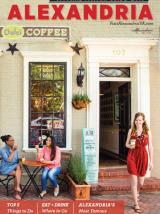 It&apos;s a great time to be part of Alexandria&apos;s tourism community."